This 14-storey apartment tower called Alta was designed by Tony Owen with Turner + Associates in Surry Hills, Sydney. The 115 apartments complex was inspired by the ‘heel of a woman’s shoe’. The apartments range from studios to three-bedrooms, each with either a balcony or winter garden. The building is one of the tallest in the immediate area allowing upper level apartments to have views. 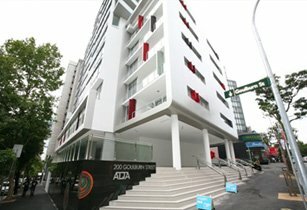 Alta is a vivacious building in the heart of Sydney’s premier food and entertainment precinct.